Can you imagine turning down 5 or 10 thousand dollars? I can tell you firsthand – it’s tough, but oftentimes, worth it. Let me explain. 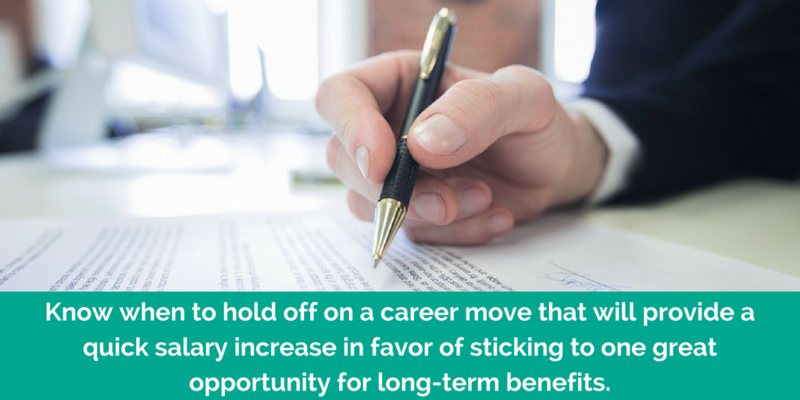 Especially in the first half of your career, knowing when to hold off on a career move that will provide a quick salary increase in favor of the long-term benefit of sticking to one great opportunity is extremely important. Sometimes when the opportunity is right, it even makes sense to take a pay cut to move to a company with high growth opportunities. How’s the company doing? A fast-growing company can be a great opportunity, but has the organization seen multiple consecutive years of growth? If the answer is yes, the opportunity is likely both exciting and stable, a pairing that can be hard to come by. Another thing to consider is the job history of the hiring manager — are they a job hopper or are they in this for the long haul? A committed leader can make all the difference in transitioning to a new opportunity. Are they willing to invest in you? A company that is willing to invest in your personal and professional growth will provide you a better long-term opportunity. Ask about training, networking groups and industry conferences. Additionally, you should be looking for an innovative company that is going to provide you with cutting-edge opportunities to learn industry leading technology and processes. Do you see multiple avenues of growth? Some careers may have just one linear promotion path, but the opportunity to grow in a variety of ways may open up a door you never expected. Multiple avenues of growth will provide you with more options in case something doesn’t work out or you decide you want to try something new. How’s the work/life balance? When considering a new opportunity, there’s much more on the table than just your annual salary and standard benefits. Do you have paid time off? Will you have the opportunity to work from home? Can you leave early for an appointment? Perhaps even more importantly, what’s the company culture like and will your personality fit well in that environment? While this last one can be particularly difficult to answer, a couple of things to look for include the ability to meet the team and shadow before accepting an offer and day-to-day access to members of leadership, which shows they are invested in their employees. Who’s offering the position? As a account manager for a recruiting firm, I know there are hundreds of reputable recruiters who exist to help talented individuals find great opportunities. But on the flip side a bad recruiter can just be looking to fill the job. If you’re working for a recruiter, do a second-level of research to make sure he or she works at a reputable, well recommended, agency. Once you make the decision to stay or go, don’t second guess yourself! Make a decision and commit to being all in with that choice and do your best to make the very best of the opportunities you have.